He's facing a $500 fine and possible jail time, but this seems like a case where the guy has already been punished enough. 68A-25.001 Feeding or Enticement of Crocodilians Unlawful. No person shall intentionally feed, or entice with feed, any crocodilian unless held in captivity under a permit issued by the Fish and Wildlife Conservation Commission or otherwise provided by this Title. I couldn't find a legal definition of "crocodilian" but it seems pretty clear that this means anything in the order Crocodylia, which includes alligators and caimans as well as crocodiles. (Fun fact: "crocodile" comes from the Greek crocodeilos, literally "pebble-worm." They may or may not care if you taunt them by calling them that, but it's a hell of a lot safer than holding out a piece of fish.) Some version of all three types is native to Florida. 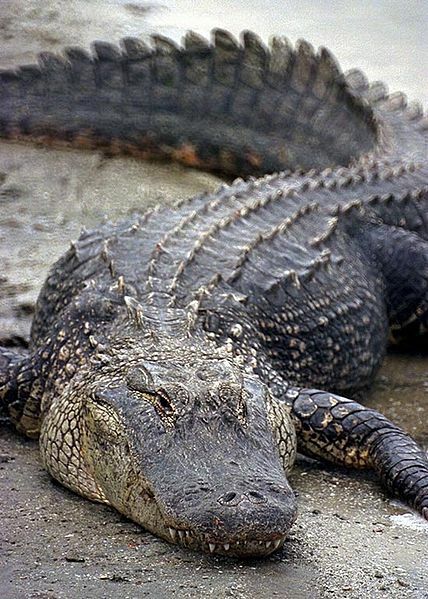 According to the Commission's website, alligators are more dangerous, and in fact it says "[t]here has never been a documented bite on a person by an American crocodile." Maybe, but please note the word documented in that sentence. Feeding a crocodilian is illegal because it causes them to lose their natural fear of humans, said David Weathers, described as "a nuisance-alligator trapper" who "often swims in the Everglades' alligator-infested waters." (The report doesn't say whether he still has all his parts.) But most likely Weatherholt is really charged with enticing a crocodilian with feed, not with intentionally feeding it. Unless there is some evidence that the gator actually got the fish as well as the hand, at least, because I don't think you could say the hand part was intentional. Luckily, no Florida court will have to struggle with that issue, because the enticement charge seems likely to stick. But again, I don't think there's much to be gained from charging punishing this guy. Justice was swift here, and if the point is to deter others from gator-feeding, I think that point's been made.